Celebrating our location in the heart of Theatreland, this week The Lobby Bar at One Aldwych will introduce its new Showtime Cocktail menu. Featuring a Virtual Reality experience and the World's first Old Fashioned cocktail trolley, each of the 17 cocktails is inspired by a neighbouring West End show. Created by The Lobby Bar team under the direction of Head Bartender, Pedro Paulo, the cocktails are split into four different categories; comedies, musicals, dramas and satires, with two exclusive ‘behind the scenes’ cocktails that take you on a unique journey. From Jasmine Breeze, reminding us of Aladdin’s magic lamp, to Ce Soir a saucy cherry number inspired by Moulin Rouge and to be shared with a friend - these cocktails are the perfect excuse for a pre or post-theatre drink or for a glamorous way to start your night in the heart of London. Executive Chef Dominic Teague has created a delicious pairing menu, with a selection of bar bites perfectly matched to each drink. Head down to Covent Garden to experience the new menu soon. Blooming with the taste of summer, fluttering full of flavours. A blend of Hendrick's Gin, Taylor's Chip Dry white Port, Coriander Bitters and Rose Lemonade. 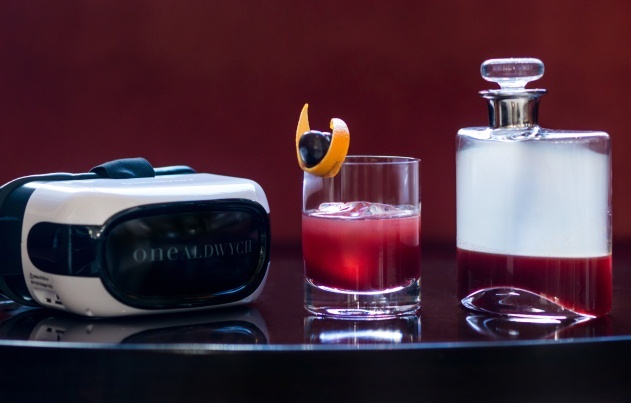 Take a trip to The Highlands with a virtual reality experience and a blend of Dalmore 12-Year-Old Whisky, Merlot Cherry Liqueur, Cherry Purée, Fresh Grapefruit Juice, Chocolate Bitters, Lallier Champagne. A passionate blend of flavours for the ultimate sophisticated sharing cocktail, with Babička Vodka, Homemade Pomegranate Shrub, Homemade Fennel Syrup, Mint Bitters and Lallier Champagne. Launching on Wednesday 29 March. See the new menu here.